Comments: Yellow-crowned Night-Herons tend to forage solitarily. They may roost and nest either singularly or in small loose colonies, usually in urban woodlands and riverine forests. Nests are usually built of sticks in tall trees and may be reused each year. Their bills are adapted to feed on crabs, crayfish and other crustaceans, but they also eat fish, amphibians, reptiles, mussels and other invertebrates. During breeding, the legs turn from yellowish-green to a coral or scarlet color. Immatures may be misidentified as young Black-crowned Night-Herons, American Bitterns or Green Herons. 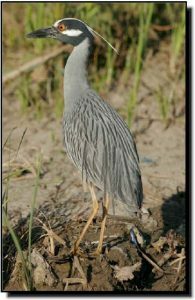 However, immature Yellow-crowned Night-Herons have a more slender appearance, longer neck, darker bill and their feet and legs extend well beyond the tail.